The ABCD Diaries: Get Back to School with the Kid's First Physics Set from Thames & Kosmos! Get Back to School with the Kid's First Physics Set from Thames & Kosmos! Thames & Kosmos currently offers more than 140 kits containing a total of more than 3,000 experiments and projects, and more than 5,000 pages of rich, colorful manual content. These kits range from small, single-experiment kits retailing for under $10 to huge, cutting-edge kits with hundreds of experiments retailing for over $100. Speed, power, catapults, and collisions! Physics is full of action! 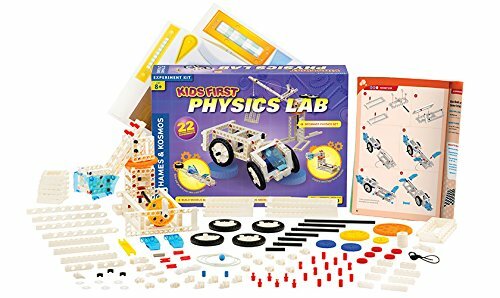 Kids will have the 20 models in this introductory physics kit racing, rolling, flying, falling, crashing, balancing, and spinning around in 22 action-packed science experiments. After following step-by-step illustrated instructions to build each model, kids test the models to demonstrate and comprehend basic laws of mechanical physics. While building the models and reading through the manual, young researchers learn about various topics in the fascinating world of mechanical physics and engineering. 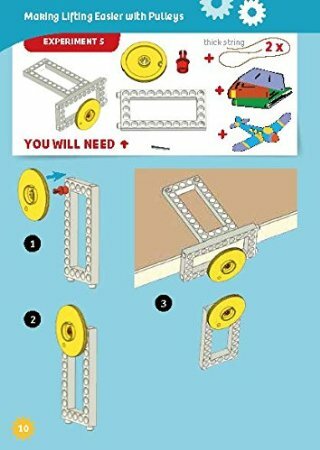 My kiddos are loving this kit, especially my mechanically-minded 6 year old:) Each project is conveniently labeled by difficulty level and comes with step-by-step instructions that are, for the most part, easy for him to understand. Both kiddos have enjoyed using this kit as an addition to our Physics curriculum this semester. It makes learning hands-on which is always more fun. I love that the booklet includes information on how the project can be applied to real world situations to help solidify the lesson in their minds and expand upon the project to figure out a practical, everyday use. The variety of projects in this kit is pretty awesome, though my 9 year old was bummed that after working so hard to build a project, you have to dismantle it to move on to the next project. However, that is pretty typical of sets of this kind. The pieces are multipurpose to make it possible to fit so many projects in each box.